Until recently I had never tried a persimmon. but I purchased quite a few to use in for table decor over Thanksgiving. 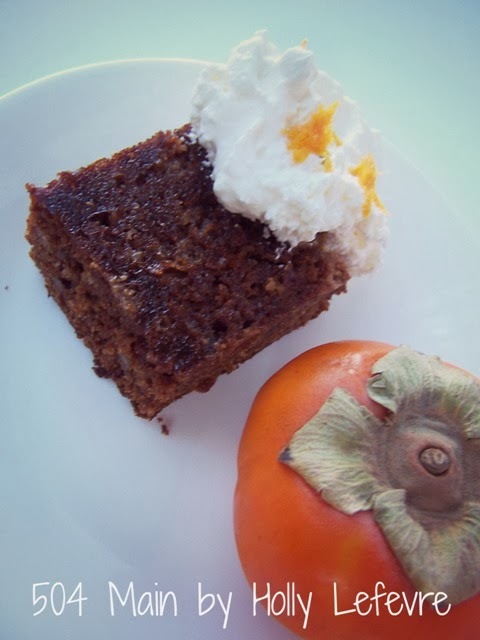 Then one morning "at coffee" someone mentioned Persimmon Pudding. Now I was really intrigued and had to try it..
but my own version, of course! I did a lot of looking around on the Internet. Prepare the Persimmon Pulp: remove the skin, by cutting it off with a paring knife; slice the fruit; mash it with a potato masher or use a blender or food processor to make the fruit into a pulp. In a mixer, combine butter and sugars. In a separate bowl, sift the flour, salt, cinnamon, nutmeg, and baking powder together. Add the flour mixture to the sugar/butter mixture, mix to combine. Add the persimmon pulp, mix to combine. Add the Amaretto and vanilla, mix to combine. Add the eggs, mix to combine. Add pecans (optional), mix to combine. Prepare the smaller pan by buttering the inside. Fill the smaller pan with the persimmon batter. In the larger pan, place about 1" of water - do this sparingly so that it does not overflow in the next step. Place the smaller pan inside the larger pan. Add additional water (carefully) once the smaller pan is in place. Place the pans into the oven and bake for 50 minutes, check for doneness, and add baking time 5 minutes at a time until done/set. This dessert was so good...we ate it all up and it was a perfect accompaniment to our holiday meal. I will definitely be making it for Christmas too! Have you ever baked with them? No doubt a beautiful moist cake :) looks so tempting :) and a great post. 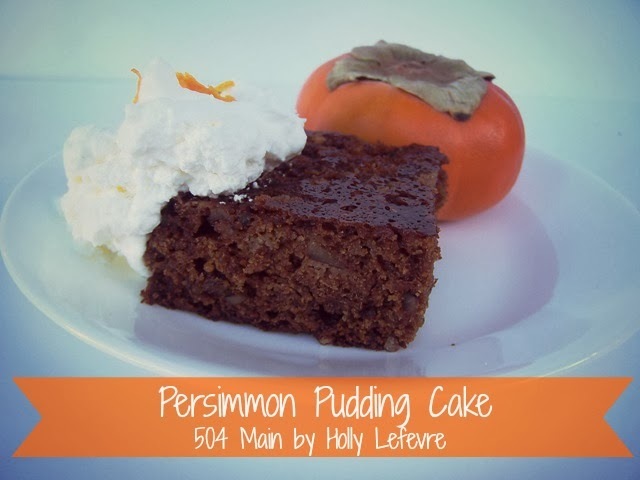 I have never had a persimmon dessert! I might need to try this. Thank you for sharing! Hey, I saw your recipe. Try the other type of persimmon next time. The long one and let it get very soft. You will get a whole different flavor. 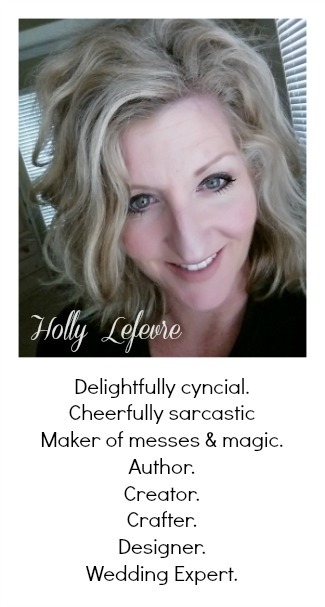 My grandma used to make persimmon pudding and you have just given me a smile and a day filled with warm memories of her :) Thanks Holly! I've never had persimmon anything before, but I bought 2 of them on Wednesday and have been stumped on what to do with them. I'll have to halve this recipe and give it a try. Thanks!